Signage is great for RV parking EXCEPT the lot is flooded due to river overflow. Thankfully an empty and old employee parking lot just past the RV lot allowed us to turn around! 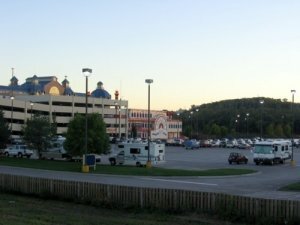 Called Casino for update info for RV parking. Off property (nearby), must cross Railroad tracks for semi truck parking with trailer storage units. Noisy. Not a close walk to Casino.